1Captain Srinivasa Murthy Regional Ayurveda Drug Development Institute India, Chennai- 600106, Tamil Nadu, INDIA. 2Siddha Central Research Institute, Arignar Anna Hospital Campus, Arumbakkam, Chennai- 600106, Tamil Nadu, INDIA. Background: Adulteration and substitution of Nagakesara is a well-established fact in the medicinal plant literature though it is referred by the authors of important Ayurvedic texts to cure piles, dysentery, hiccup etc. The botanical identities of controversial sources of Nagakesara are flowers of Mesua ferrea L. and Ochrocarpus longifolius Benth. and Hook. f., Calophyllum inophyllum L., Dillenia pentagyna Roxb. and perchance their allied species. Though immature fruits of some Cinnamomum species are also reported to be sold as Nagakesara/Sirunagappu in the crude drug markets there are no pharmacognostic studies available for the identification and analysis of this crude drug. Materials and Methods: In this study, marketed Nagakesara/ Sirunagappu samples were procured from Chennai raw drug market and analyzed as per the standard methodologies for pharmacognostic studies. 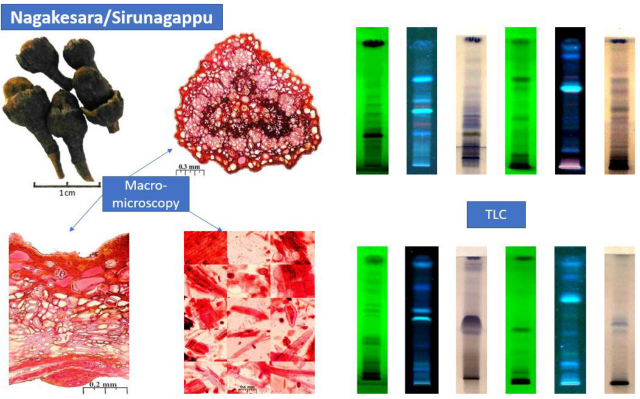 Results: Macro-microscopical characters and chemical identity of the samples of immature fruits were established to derive set of characters for the identification of this marketed material. The proposed results would help in identification of this crude drug while used as substitute drug for the official source. Conclusion: The botanical Nagakesara or Sirunagappu is neither stamen nor flower, but it is fruit of Cinnamomum species. As Western Ghats is habitat for several similar looking species of Cinnamomum, there is necessity to study the pharmacognostical characters of all species of Cinnamomum before concluding the botanical source of this ambiguous raw drug of Ayurveda and Siddha. Arunachalam C, Maheshwari B, Nartunai G, Ilavarasan R, Kumar KN, Sathiyarajeswaran P. A Pharmacognosy Approach to the Botanical Source of a Cinnamon Fruit Traded as Nāgakeśara and Sirunagappu in Raw Drug Markets. Pharmacognosy Journal. 2019;11(1):81-87.